The late Tony de Brum’s moment of glory. 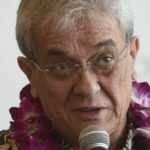 Tony de Brum, the Foreign Minister of the Marshall Islands (pop. 53,000) has died. He will be remembered for one thing only. But it was a big thing, and de Brum was the hedgehog. I’ve told the story before. In the closing days of the COP 21 conference in December 2015 that negotiated the Paris Agreement on climate change, there was still a big gap between the developing countries and the rich ones. The G77 alliance of developing countries, led by China, India and South Africa, was demanding more and more language on differentiated responsibilities, to the extent of effectively going back to the disastrous Kyoto principle that only rich countries had to cut; more finance than the $100 bn a year promised in Copenhagen; and language on loss and damage that was unacceptably strong to the rich countries. However, the alliance was divided on the 1.5 degree aspiration, with the big four â€“ China, India, South Africa and Brazil â€“ against it. 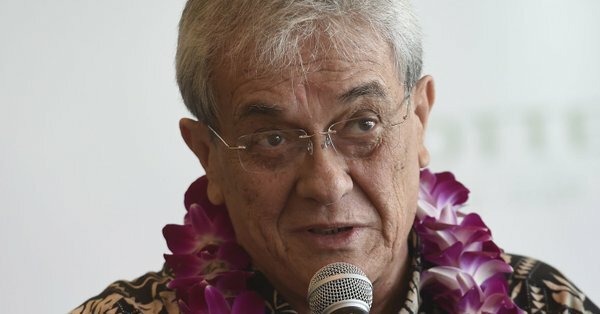 This opened the door for a well executed diplomatic wedge.Â Tony de Brum of the Marshall Islands took the lead (at somebodyâ€™s suggestion, no telling whose) in forming a â€œcoalition of high ambitionâ€, including many of the G77 plus the EU, the USA, Canada and Australia. In effect, the rich countries offered 1.5 degrees to split the G77 and isolate the big four. The poor countries on their side had to drop the demands on differentiation and finance; on loss and damage, the difference seems to have been split â€“ but crucially with no admission of legal liability (Decision, paragraph 52). Before the end, Brazil jumped ship too. Their troops having deserted to the enemy, China, India and South Africa folded, and the way was open for the deal. It is most unlikely that de Brum thought this up. He was not otherwise known as a Talleyrand, far from it. When he attended a meeting of the IMO, the UN organisation responsible for shipping, he was surprised to find that his country’s delegation had been taken over by the Virginia corporation that manages, and takes most of the loot from, his county’s vast shipping registry. On grounds of complexity and cui bono, the prime suspect for the Paris coup is Todd Stern, the wily and experienced US envoy. De Brum’s role was as the front man, the harmless guy everybody likes, the salesman. Don’t despise that: and de Brum was not a mercenary but fighting for his tiny country’s vital interests. It took a lot of commitment, nerve and chutzpah to face down China and India, and de Brum’s held to the end. As it recedes into history, the Paris COP21 is emerging as one of the key moments in postwar history, on a par with the launch of the Marshall Plan or the signing of the Treaty of Rome. The inclusion of the 1.5 degree C target took far more knowledgeable observers than yours truly by surprise. Its role in the whole deal is to shift the Overton window: 2 degrees is no longer the wild upper limit of ambition, but the reasonable compromise that sensible men build into their calculations. The next steps in climate diplomacy will all be about whether to go firm on the harder target. There certainly won’t be any change in the easier one. Tillerson has conceded there are no actual US proposals for Trump’s promised â€œrenegotiationâ€ on the table, and if they were, they would be ignored.